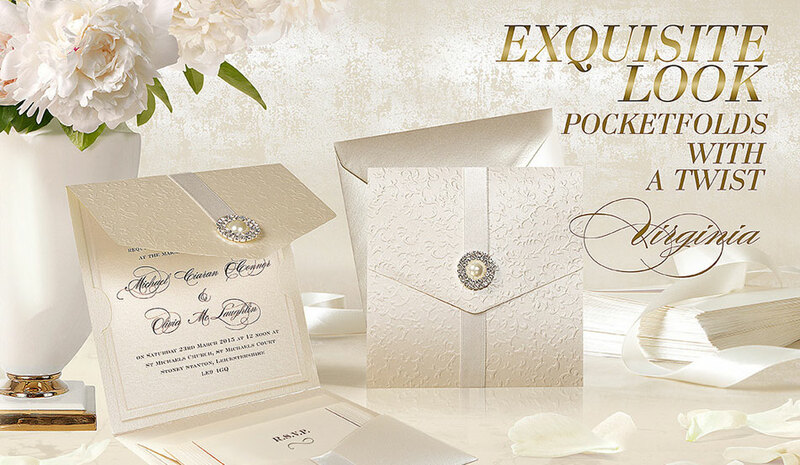 Luxury Wedding Stationery Collection is a fusion of elegant beauty of layered wedding invitations and effortless splendor of pocket fold designs. The collection provides the luxury of customization combined with the ease of personalization, resulting in unique styling and premium quality. Luxury wedding stationery is created to take your wedding from usual to something shining and sparkling. Polina Perri creative studio offers its luxury wedding invitations that will give a refined look to your wedding day. Luxury Collection comprises pocket fold wedding invitations (otherwise called multi-layered), bow and lace wedding invitations. Our best selling Virginia, Chantilly, White Virginia, Amelia, Regina White and Sophie pocket fold wedding invites would be a beautiful suite for those who wish to have all in one: an invitation, a reply card and optionally other useful info cards inside the pocket. The beautiful design cards displayed here are imposing Virginia pocket fold cards in ivory and white colors: the embossed texture of their high-quality card stock combined with a satin ribbon of coordinating color and rhinestone embellishment keep them in favorites among our clientele. Their elegant but luxurious look is the key secret of success, as the pocket style layout is so convenient: it allows keeping the reply card and any additional cards in a pocket so that they are well systematized and look like a piece of something significant and essential. A magnificent look of the Regina White invitation conquers by its royal chic and simplicity of the layout, its shiny paper with silver foil stamping is decorated with a unique triangle brooch. The card has a handy pocket fold design, as well as other luxury wedding invitations: the Amelia card in cream shimmery color and ivory Sophie card, decorated with delicate natural lace and boho style brooch. A sweet novelty of our collection - Chantilly wedding card, featuring famous French lace pattern outlined with a blush hue. It's tender elegance and innocent charm is terrifying! Polina Perri design studio works in close cooperation with discerning clientele, using thoroughly hand-selected materials that are being transformed into gorgeous arts in the hands of expert craftsmen. At Polina Perri, we are passionate about beautiful design, exceptional typography, high-quality paper and best materials that reflect the high style of the end product. Our design studio offers personalization of your luxury wedding invitations to add a genuine individual touch. Polina Perri team will help you to select the font style and colors coordinated with the color scheme of your wedding. They will design your wedding monogram or artistically apply your couple's initials to accomplish the wedding invitation as well as the whole wedding stationery suite. They will work through the customization of your order, proposing different design ideas that will result in a one-of-the-kind luxury wedding invitation. Our luxury wedding invitations are accompanied with the matching style wedding stationery - it will save your time spent on a search of coordinating cards. A page with the description of each particular wedding invitation contains Related Products section, where you can find and order a whole set of wedding stationery items: RSVP cards, Thank You cards, Order of Service brochures, Wedding Menu Cards, Table Number cards, place cards, wedding invitation boxes with personalized decorative belts. Polina Perri UK provides unprecedented speedy servicing - an electron mock-up of your invitation will be ready within 48 hours after your Polina Perri order placed! Making your big day majestic and unforgettable is our primary focus, inspiring us for nothing less than perfection.